So, the game-changer is here. First time a quota in jobs and educational institutions on the basis of economic deprivation in lieu of socio-cultural-educational deprivation has been legislated. The Parliament has passed the 124th constitution amendment bill of the Modi government bringing in 10% quota for the economically deprived non-reserved category citizens. 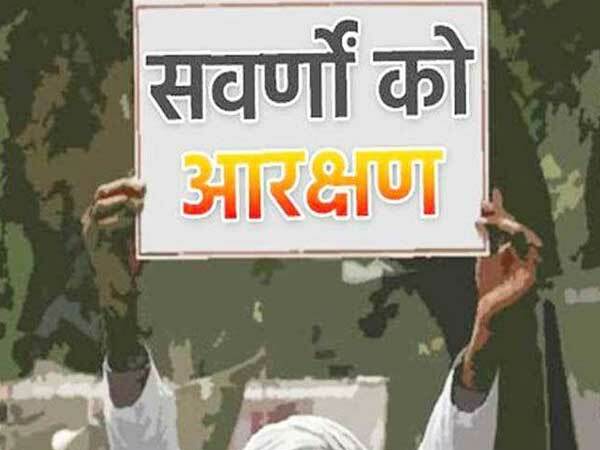 Since it talks of economic criteria, addresses the grievances of Brahmins, Baniyas, Patels, Marathas, Gujjars, Thakurs and perhaps even the Muslims and the Christians the first time ever, it is considered to be a master-stroke of Modi before the general elections of 2019. This is noted to have broad-based the reservation policy, created more equality for the less privileged unreserved citizens, and yet not upsetting the lower castes and tribals as their 49.5% total reservations based on castes remain untouched. Looks too good to be true? Indeed. And it has surely foxed the opposition parties who have all rallied to support the bill grudgingly except MIM. So far so good. Now the real questions, and some scratching below the surface. First, with just 90 days to go for the general elections, a major policy issue like additional 10% reservation, and for the first time on economic criteria, is being declared without adequate time to actually execute it. So, is the timing not wrong, and is it not just a political stunt without honesty of execution? Second, since the reservations originally had been envisaged for ameliorating social deprivation and centuries old caste based injustice, is legislating it on economic criteria alone not a violation of the spirit of the Indian constitution? Third, even if constitution amendment bill is passed in both the Houses of Parliament, is there a guarantee that the assemblies of 50% or more states of India will pass it to make it a valid amendment? And can that be done before the Code of Conduct for the LS polls come in? And even if they do, will it stand the test of legality and constitutional validity in the Supreme Court which had in an earlier case already capped all forms of reservations to a maximum of 50% (and the current SC-ST-OBC reservations already measure up to 49.5%)? Fourth, the BJP had bitterly fought the politics of reservation of VP Singh, known as Mandal politics (based on the reservation recommendations of BP Mandal Commission), in 1990, and brought in its own version of Kamandal politics through the Ram Janmabhoomi movement, which finally brought down the VP Singh government. Now more than a quarter century later, has Mandal scored over Kamandal, and BJP eating its own humble pie resorting to reservation politics, facing defeats in the five state assembly polls recently? Has the ruling party come to a conclusion that Hindu polarisation through the never solved Ayodhya issue is becoming increasingly untenable as an election winning tactic? Fifth, Modi came to power in 214 riding on his then Gujarat CM image of Vikash Purush. Now, has the Arakshan Purush taking precedence over the Vikas Purush? Is this a hurried burial to the so-called development politics of BJP in power? Sixth, the current policy says that those below Rs 8 lakh annual income or owning less than 5 acres of land can avail of the benefits of this quota. That is Rs 66,000 income a month. If so, is this the new poverty line of India? And then why are people above Rs 20,000 income being taxed? Why do people have to go for hartal in the country asking for minimum wages of Rs18,000 per month? Seventh, BJP minister Nitin Gadkari is on records saying that there are no substantial jobs being created in the economy. If so, then what does such an additional reservation solve? Or far that matter, there is no value of the existing 49.5% reservations as well. Reservation without creation of jobs is like dividing a desert. Whatever share you get, there is still no water to grow crops in a barren desert. Council for Monitoring Indian Economy has noted a week ago that India has lost 11 million jobs only in 2018. So what do reservations actually bring in except some empty promises? And without 'affirmative action through reservations' in the private sector jobs, will this policy mean anything worthwhile on ground? Eighth, the BJP has always been called a Brahmin-Baniya party, and with this reservation for upper castes, will this perception not become further strengthened? And if this reservation above 50% in total is struck down by the Supreme Court, will it be brought within the allowed 50% thus making lower castes lose their share? Is it politically tenable? Ninth, if economic relief has to be given to poorer sections, is reservation the right route or schemes like loan waivers, income generating projects like MNREGA, free cereals, benefits through cheaper education, scholarships, etc.? Will reservations without jobs creation bring any real life game change on ground or will it be another joomla (mere announcement with no action)? Tenth, and finally, while reservations were originally planned by the architects of the Constitution for just one decade, it got extended decade after decade, and yet social justice is said to have eluded the masses. What is the guarantee that the additional 10% quota on economic criteria will also not meet the same fate and get extended without any substantial impact on ground? Is reservation any long-term solution to poverty alleviation or ensuring social justice? However, this is a long-term question, and all political parties except the Left are guilty of using reservations to cultivate vote-banks among Indian electorate. The debate is wide open. The advocates of 10% quota are in an ecstasy of perceived victory. And the critics in the opposition are crying hoarse calling it an election gimmick that won't stand the test of time and law.